Venture out on a scuba/snorkeling trip to Tapu Island, one of the famous limestone islands jutting vertically from the waters of Phang Nga Bay, and known to 007 fans from the film Man with the Golden Gun. If the people of a place can color your impression of it, then the gracious staff of The Sarojin will add immeasurably to your visit. British owners and directors Kate and Andrew Kemp have absorbed the Thai people's exceptional spirit, warmth, and genuine hospitality, and passed it on to their international staff. The idea is simple—to create an experience so personal and revitalizing that you'll feel as though you?ve just unwound at a cherished friend' private estate. Bordering five national parks of spectacular primary rain forest, idyllic lagoons, and natural mangroves, and sharing Khao Lak, a nearly seven-mile-long stretch of white-sand beach on the deep-turquoise Andaman Sea, the resort is a contemporary Asian oasis of restoration and harmony. Each of the 56, one-bedroom "guest residences" is designed with clean lines, uncluttered and open spaces, and an emphasis on symmetry. All are set among serene gardens and benefit from luxurious couple's baths and rainfall showers set among natural wood, stone, and botanicals. 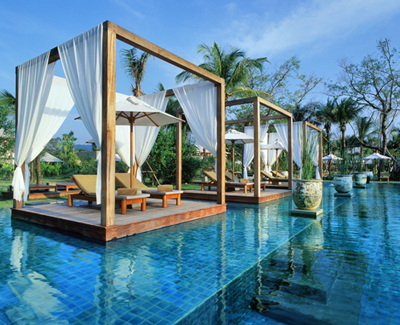 Some suites have an outdoor Thai sala ("place of rest") or pavilion, and others enjoy a plunge or relaxation pool. Should you desire to leave this blissful atmosphere, The Sarojin encourages your enjoyment of the area with its in-house "Imagineer," the ultimate personal concierge who can arrange most anything, whether it's a private Thai cooking lesson and gourmet lunch by a waterfall, elephant trekking, bird watching, or a personal jungle adventure just for two, complete with champagne. Simply stated, a visit to Sarojin will restore sunshine and warmth to your spirit.